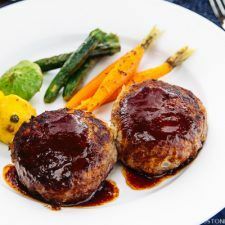 Served with a red wine reduction sauce, this homemade Japanese hamburger steak (Hambagu) recipe is big on flavors. The meat is juicy and melts in your mouth. Perfect in a hot frying pan or summer grill outs! I still remember vividly how my mom and I spent many evenings making Japanese Hamburger Steak or Hambagu (ハンバーグ). If I was home, she would call me around 4:30 PM and always encouraged my presence in the kitchen. Unless I was in the middle of a novel that I couldn’t stop reading, I didn’t mind helping her out most of the time. That’s how I learned cooking Japanese food from her. 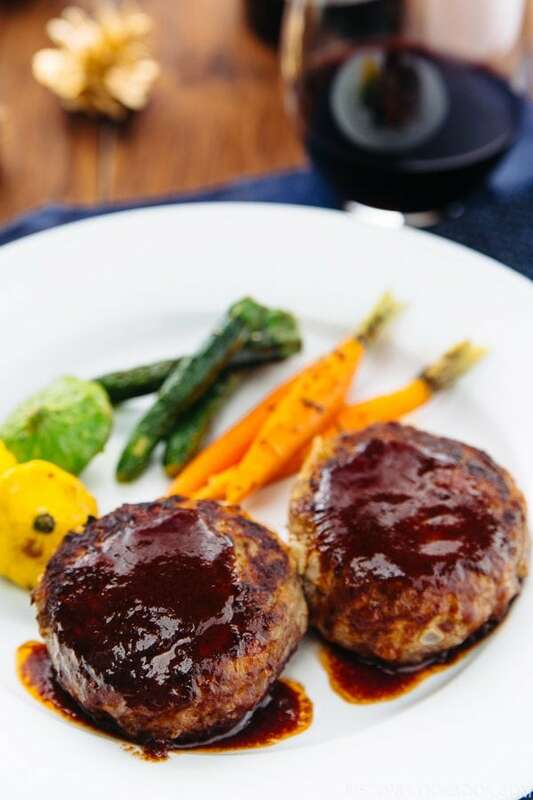 Japanese Hamburger Steak, or we call it Hambāgu (ハンバーグ) or Hambāgu Steak (ハンバーグステーキ), is a popular dish enjoyed both at home and at Yoshoku (Japanese style western food) restaurants. It’s a steak made from ground meat and usually served with rice rather than buns. While researching facts about Hambāgu on Japanese Wiki, I learned that there is an American version of hamburger steak and it’s very similar to a dish called Salisbury Steak, both of which I’ve never tried before. The common theme for all these hamburger steaks is that they are made from a blend of minced beef (In Japan, it’s both beef and pork) and other ingredients. 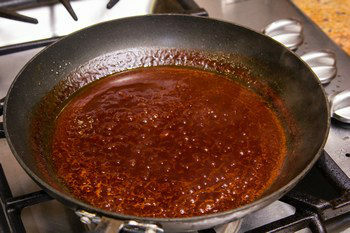 There are many variations of Hambāgu in Japan, like Wafu Hambāgu (soy sauce base sauce with grated daikon), Teriyaki Hambāgu, Demi-glacé Hambāgu, and more. Not to mention, there are different topping options, such as sautéed shimeji mushrooms and fried egg. But today I’m sharing the basic Hambāgu recipe with a homemade sauce. As I mentioned earlier, Hambāgu in Japan is typically made from both ground beef and ground pork, and the common ratio is 7 : 3. Japanese supermarkets sell a convenient package of both ground beef and ground pork (we call it Aibiki-Niku 合いびき肉) so that we don’t have to buy the meat separately. We use this Aibiki Niku for Korokke, Spaghetti Meat Sauce, and Hambāgu recipes. 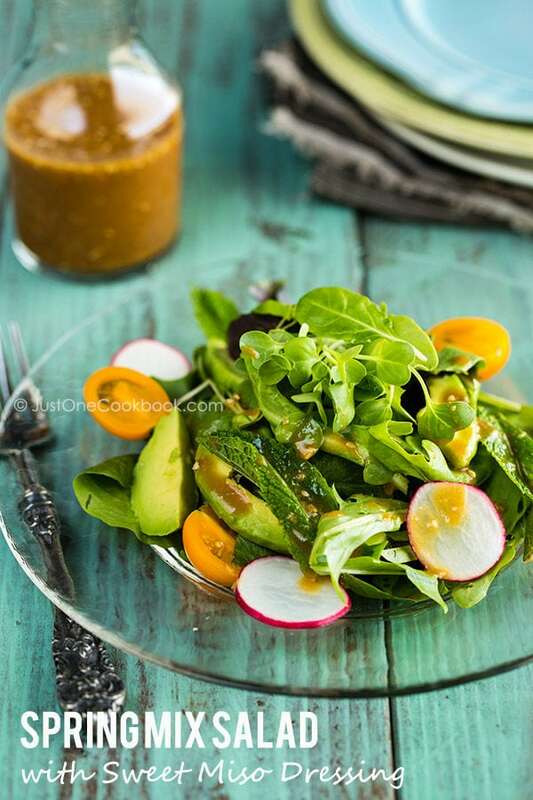 To enhance the flavor of Hambāgu, below are a few important tips which I learned from my mom. I also included a video on how to toss hamburger steak to force out the air pockets. Sauté onion slowly and then cool it down completely. The cooked onion will add natural sweetness to Hambāgu. Knead the mixture into gruel with hands. 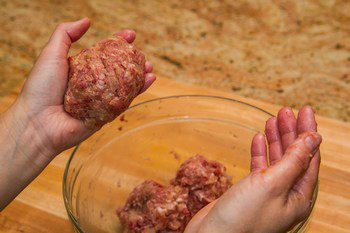 Play catch, tossing meat mixture from left hand to right hand a couple of times in order to release the air inside (See video below). Cool down the meat patties in the refrigerator for 30 minutes and take them out only right before cooking. Indent each patty with fingers to avoid explosion or crumbling of the meat patties when you cook. The meat will expand during cooking, and the indentation will disappear. Here is how you toss Japanese hamburger steak to force out the air pockets. You can sear the meat patty in a sizzling hot frying pan to brown the steaks, and then cook the red wine deduction sauce in the same pan. The rich sauce adds another layer of flavor to the already juicy Hambāgu. Serve the steak with a bed of grilled vegetables, you will have a fancy and extra special dinner that doesn’t cost a bomb. This is exactly the kind of recipe that calls for a bottle of red wine and a reason to celebrate. Now before I share the recipe, Mr. JOC will talk about his review on the wine that we pair up with Hambāgu. Chop the onion finely. With the knife tip pointing toward the root, slice the onion to within 1/2 inch of the base. Make about 1/4 inch parallel cuts. Then slice the onion horizontally about 1/4 inch parallel cuts. Then cut perpendicular to the first slices you made. If the onions need to be chopped finer, you can run your knife through them in a rocking motion. Be sure to hold down the tip of the knife, otherwise the onions are going to go flying around the room. 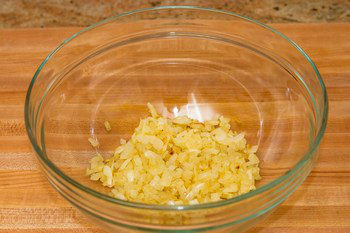 Heat oil in a large pan over medium high heat and sauté the onion until translucent. Season with ¼ tsp salt and pepper. Transfer to a large bowl and let it cool. 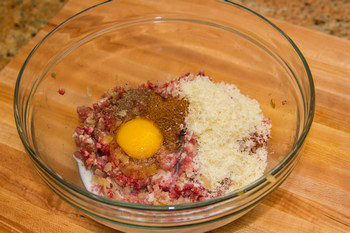 Add the meat in the bowl and mix all together. Add an egg, milk, Panko, 1 tsp salt, black pepper, and nutmeg. 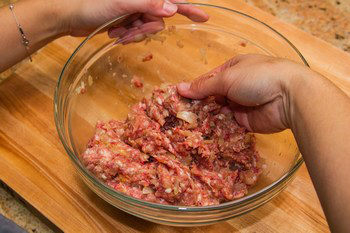 Mix the meat well with your hands until the mixture gets sticky. If you want to keep your hands clean, use rubber gloves or use plastic bags. 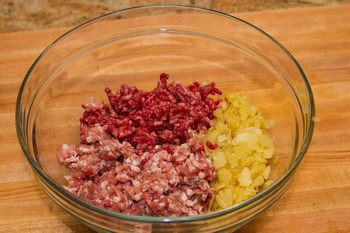 Pinch off 2 inch from the mixture and make 4 large patties (or 6 medium patties). Toss each portion from one hand to the other hand repeatedly about 5 times in order to release air inside the mixture (see the video link above). The hamburger steaks will crack while cooking if you don’t release the air inside. Make oval shape patties. The top shouldn’t be flat, more like round. Keep in the fridge for at least 30 minutes before cooking so that the meat combines together. In a large pan, heat oil over medium heat and place the patties gently on the pan. Indent the center of each patty with 2 fingers because the center of patties will rise with heat. Cook the patties about 5 minutes. Do not flip until nicely browned. After you flip, pour red wine and lower heat to medium low heat. Cover and cook for 5 minutes to thoroughly cook the inside of the patties (adjust cooking time depending on thickness). Then uncover and increase heat to medium high to let the red wine evaporate. When it’s almost gone, transfer steaks into individual plates. Do not wash the pan. 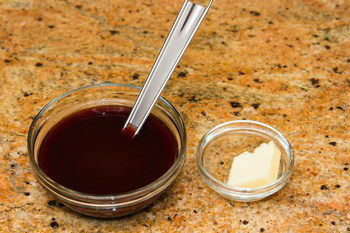 Combine the liquid sauce ingredients in a bowl. In the same pan (without cleaning), add butter and sauce ingredients and mix well. Lower the heat to medium low and let it simmer for a few minutes until alcohol smell is gone. While simmering, you can skim off the scum and fat. When the sauce thickens, pour the sauce over the hamburger steaks. 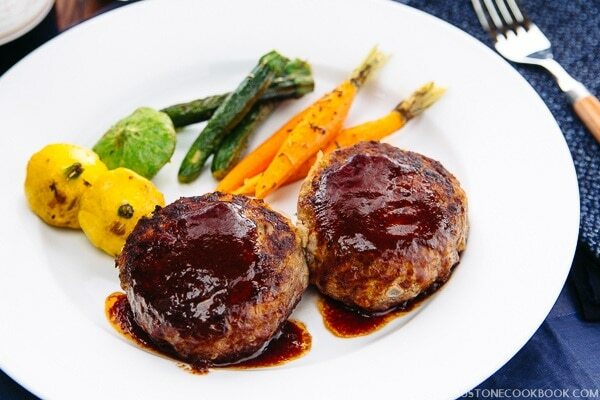 Serve the hamburger steak with vegetables over your favorite side dish. Ground meat: The good ratio for hambagu is 65% ground beef and 35% ground pork. I usually make with roughly 50-50 for convenience. You can make hambagu with 100% beef, however it will not be as juicy and soft as combined meat. Please note: We received no compensation for this review. We received a bottle of Meiomi from Jarvis Communication free of charge to use in exchange for an honest review. Editor’s Note: The post was originally published on December 17, 2012. The content has been updated on August 2017.
oh that looks very moist and flavoursome! Certainly a burger steak that I want to try for sure. That looks so good Nami! If only I have the ingredients, I would follow your recipe right now. I’ve had Salisbury steak and I love it! 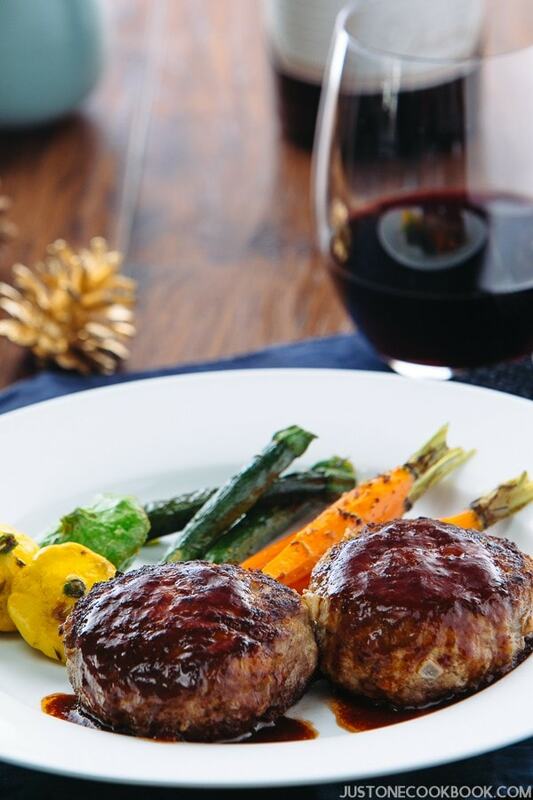 Your red wine reduction seems perfect with the burgers. I can’t wait to have the ingredients and try this recipe! I can’t wait to try this hamburger, you plated it so beautifully and deliciously with the veggies! I’m definitely pinning for the first opportunity. Thanks for the great tutorial! Oh, look mouthwatering and super yummy, Thanks for sharing the tips too. Now I like the look of that sauce! Yum! No need for a bun. My dad didnt make it that fancy, but glad to know we weren’t the only ones eating burgers with rice! 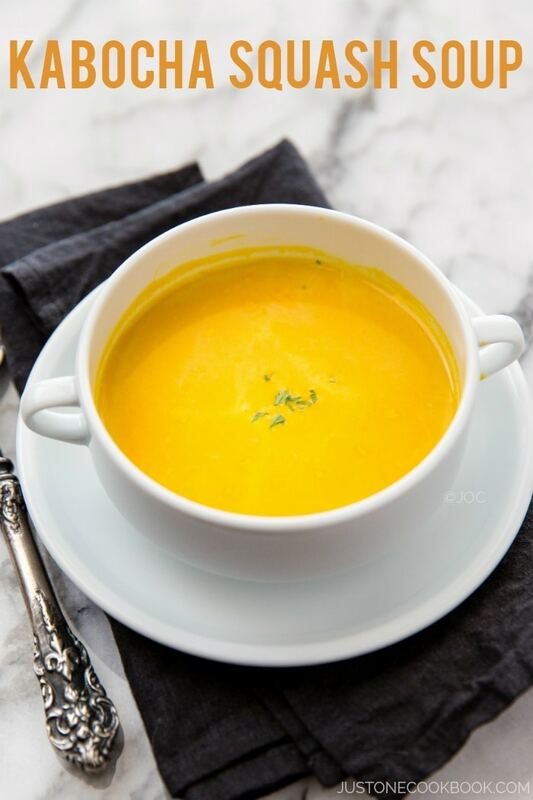 This is a terrific low carb meal which I will definitely need after the holidays. Thanks for sharing the tips also. yum! and what great memories cooking with your mom! OH this steak looks INCREDIBLE!!! I love Hambagu Steak! The first time I had it was in Taiwan and it’s different than what I expected and so delicious. I haven’t seen it here in the States so I’m so glad you posted this up! Thank you! I’m sorry but I had to laugh when I read the instructions for making the hamburger patties. 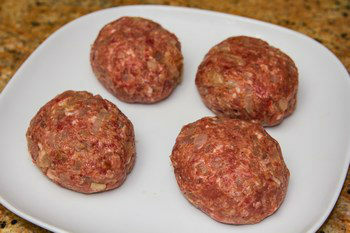 Western ‘wisdom’ says that the ground meat should be handled as little as possible to keep the patty light and tender. Especially avoiding the heat of one’s hands. So the rather forceful method you describe is very surprising. 🙂 I too like to add a tablespoon or so of caramelized onions to my hamburgers for that rich sweet flavour. And my mom always liked to add rich fatty pork to her hamburgers. But my favourite part of your recipe was the red wine sauce. Definitely meant to be served with an expensive steak and not the ‘humble hamburger’, as it’s considered in the west. It makes me want to run out a buy a good bottle of Pinot Noir to serve with the t-bone steaks now sitting in my freezer. Thank you again for sharing another part of Japanese cuisine with your fascinated readers. Hi Maria – how interesting indeed! I learned those tips from my mom first, but they are actually commonly practiced in Japan, and cooking shows and books show the same method. So this is very cultural difference on how to make hamburger steak! I had fun reading about Western method as I’ve never had Western version before and I didn’t know how they are commonly cooked. Thank you so much for sharing!! Hamburger steak sounds like something I would LOVE! I miss cooking with my mom, such great memories!!! How convenient that they actually sell both ground beef & pork together. The rich brown sauce looks absolutely marvelous, Nami. Someone mentioned topping fried egg on Japanese hamburger and having the yolk soaking the meat. Oh my…I see that you used nutmeg in the recipe. Is this traditional? Your hamburger steak looks so delicious, Nami! I love the red wine reduction! I so do not associate hamburger with Japanese food lol. But These do look very tasty with the unique flavors. They are cooked beautifully. Great tips too! 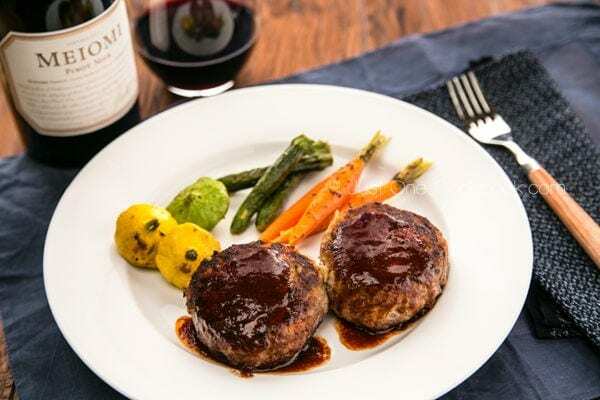 What an interesting recipe, Nami, the nutmeg is definitely a tip of the hat to French food, and I can see why it would pair well with the wine your hubby selected. I’ve been meaning to make my own patties since I received the kitchenaid meat grinding attachment. If properly done, you can even eat it rare. Scrumptious and really moist! I love hamburger steaks. Yummy! I love that it is called a hamburger but it’s not in buns. Love it! I think about every cuisine has some kind of hamburger (well, ground meat at any rate!). I’ve never had mine made Japanese-style before, however. What great flavors! I love the mix of beef and pork (best way to make meat balls too, IMO). Really good stuff – thanks so much. I love when pork and beef are mixed together…your little hamburgers look awesome, so plump and juicy…yum! Your hamburger steaks look truly tempting, Nami! My family loves hamburgers, and I know they’ll enjoy these (especially drizzled with that rich sauce). I enjoyed your husband’s wine review, too! We call them rissoles here and have them often too. I normally make them with 100% pork but I like your combination of beef and pork Nami. Great presentation too! I remember eating Japanese hamburgers in Japan when we were young. They were so delicious and asked our aunt for the recipe. I lost it many years later. I am happy to see it on your site. Delicious!! Hi Nancy! I hope my recipe is as good as your aunt’s. Every family has their own way to make it, but basic ingredients etc are pretty much same. Hope you can adjust it to your liking! 🙂 Thank you so much for your feedback! Looks delicious…it is a Japanese Salisbury steak…which I make quite often. Beautiful pictures as usual, they look so juicy and rich. The most delicious-looking homemade meal! I feel like laughing, ’cause my Mom gave me about the same tips when we oft made ‘kotletid’ [hamburger patties, rissoles . . .!] and that was half the world away and decades ago 🙂 ! In N Europe it was 1/3 ground beef. 1/3 ground veal and 1/3 pork [veal now hard to get, so I make it 1/2 and 1/2!] Well, we did not have panko, but always made our own breadcrumbs!! 😀 ! Yum!!!! As usual, it looks amazing! There is a little Japanese restaurant here in Vancouver that was called Yoshoku-Ya that served only western Japanese cuisine! Now I know why it is called Yoshoku-Ya! Is there a typographical error in the quantity of beef and pork meat? Shouldn’t it say 8.5 oz, rather than .85 oz? The decimal seems to be in the wrong place to me…? Thank you so much! It was actually .85 lb! 🙂 I hope you enjoy it! Nami, I still don’t know how you do it – cook and take photos of step-by-step! That’s so crazy! That said, I really appreciate your step-by-step because it takes the intimidation factor out! You make it look easy, hence encourage people to try also! And of course, hambagu is a good recipe to have for family dinners! I didn’t know about making the indentation in the middle of burgers. Learned something new. Hubs would be thrilled if I made this for him. He adores Japanese food so much and this is one of his favorite. i also enjoy it when it’s juicy and saucy. And of course, don’t forget pinot noir…or anything red. Yum! Excellent recipe, Nami. especially love the sauce, and also adding pork – I’ve never thought of that. yum. I’ve always enjoyed these in the restaurants and didn’t know its that simple to make! Thanks for sharing! Looks delish. I love all your cooking tips! I apprecaite the wine info as well. Oh my… my boyfriend is going to be SO HAPPY about this recipe. He lovesss Japanese hamburg. Especially in curry! This looks wonderful. Unfortunately I didn’t have a chance to taste hambaagu when I was in Tokyo, but I have already put it on my list for next trip (I’m very positive as you see!). I am sure I would love it because what I hate most is hamburger without any seasoning and these are just like those I make at home: with fried onions! (I had no idea it was a Japanese touch 😉 ). I am very intrigued by the meat ratio. I usually put half pork and half beef whenever I use ground meat. I must try this way next time. The hole in the patty is such a wise idea because whenever I make fried patties they tend to break… Thank you so much for this wonderful recipe and such useful tips. What a coincidence I made something similar but with chicken. Your hambagu looks totally out of the world and the sauce yum..
Pinot Noir is my husband fav wine, be it with white meat or red meat 🙂 Thanks for teaching that technique through the video. It helped! My boyfriend loves hambagu kare! He was surprised when I first convinced him to try it, he was expecting a dry American hamburger patty and instead was delighted with the moist meatloaf-like Japanese version. I actually made a dish once called “Asian Style” Salisbury Steak and it was amazing, this looks even better! I was really surprised to see “hamburger steak” as the heading of one of your email notices. I had to check it twice to make sure I was reading it right. 🙂 So there ARE some basics dishes that are shared across cultures. I grew up in a house where hamburger steak was the standby meal when mama didn’t want to spend a lot of time in the kitchen. It’s interesting because your steak recipe is almost exactly like my mama’s except that she used bread instead of panko. Of course the sauce was more of a brown gravy which is completed different from yours. I do love your sauce/gravy. A lot lighter. This dish definitely takes me back! Lovely, lovely pics! This looks delicious Nami. Ive never had Japanese Hamburger. Love the sound of these, especially that sauce. I like the beef and pork pairings. Extra tasty! I never knew about the other variations. When I was in Japan, I must’ve had this 3 times in a week in addition to the amount of yakitori and ramen I was gulping down. Nami, these sound wonderful, what a fun, unique version of a hamburger steak. You always have something interesting and delicious! I love a good Japanese Hamburger Steak! I enjoyed my share here in restaurants. Great tips, honestly I never made hamburgers at home, I always buy it in the supermarket, but I’m sure making it at home is absolutely better. Having onions at that point really give a nice sweet touch…your mother is a genius…!!! I just love that sauce! Nami, You’ve created a true comfort food meal to inspire us in our kitchens! Looks very delicious. I would like to try and make it this weekend. Just one request., I love eggs benedict. Would you have your own version for making it at home? Thanks so much! will you be able to show us what brand tonkatsu sauce you used. i couldn’t enlarge the picture to read the brand. I am mostly a non-meat eater, but my husband is an avid carnivore and I am always looking for new ideas. This goes in the to-do list. BTW, I loved the first picture. Nice styling. You are absolutely spot on for using 50% beef and 50% pork! I can imagine how soft and delicious these hamburger steaks would be with that combination as I might even use a little bit more pork over beef sometimes for a spaghetti bolognaise. I was hoping to see the inside of the hamburger and you didn’t disappoint with that last photo. Awesome recipe as always. Who knew there was a Japanese version of Salisbury steak?! This is a very familiar dish for me and your version looks wonderful! Thank you for the wine advise, we love to drink wine in our house and always tasting something new. I love the sauce a lot here, make a very interesting dish. I admire you for doing step by step photography, so much work. You are the best Nami! Thanks for the helpful hints, Nami! 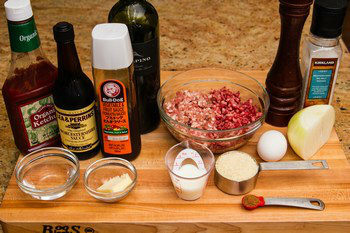 Have bookmarked this recipe to try next time I make hamburger steaks! I actually made some last night for dinner (hadn’t read your post yet!) 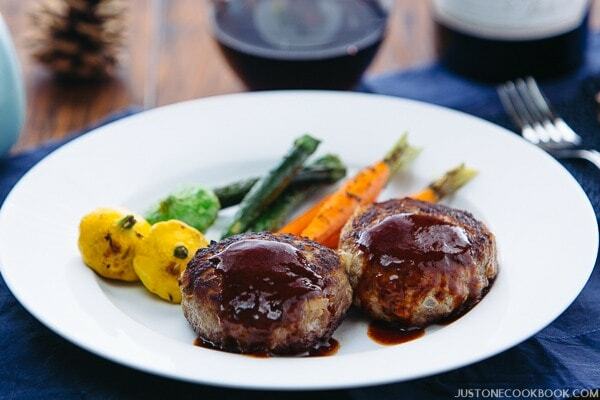 and served them with a red wine/mushroom sauce, but used all beef — the pork addition you suggested sounds flavorful! Also loved the description of the wine your hubby reviewed. Happy Holidays! Oh my goodness – I haven’t had this since grade school! And of course I had no idea this was makeable at home. 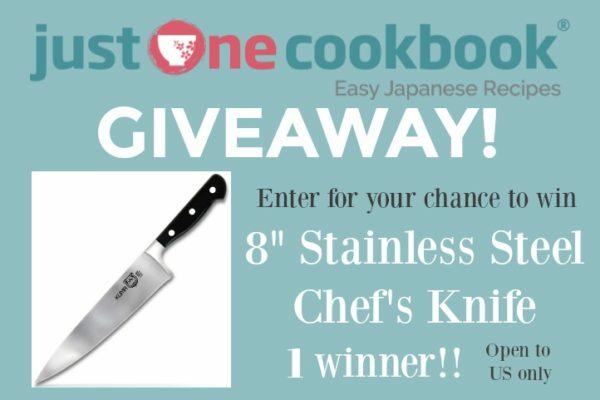 I actually have all of the ingredients too – especially since I stocked up on the tonkatsu sauce last weekend! Have you ever added chopped and sauteed celery and carrots along with the sautéed onions? That’s how they did it in Hawaii. Plantation days. That’s how my mom used to make it (sans the red wine reduction). I’m planning to try your recipe with the celery and carrots. Let you know how it turns out. Nami – Japanese Hamburger Steak – now, that sounds interesting. I never knew there was such a dish but it certainly looks delicious the way you prepared this – a true family-style comfort-food meal! Wonderful recipe! I am very sorry that I am so late with my comments – but you know how it is around this time of year – these days, I feel like I am running a small restaurant, so many meals to prepare, so many guests to cook and bake for. Looks really good! Best of all, I have all the ingredients in the cupboard, so will definitely be making myself one to eat this coming weekend. I made this tonight, and it turned out FANTASTIC! I invited my mother over to try them, and she loved them too. I even have one left for my bento lunch tomorrow, which is perfect! I served them with steamed long green beans and Japanese rice. Yum! Thank you for sharing all this delicious food with us. 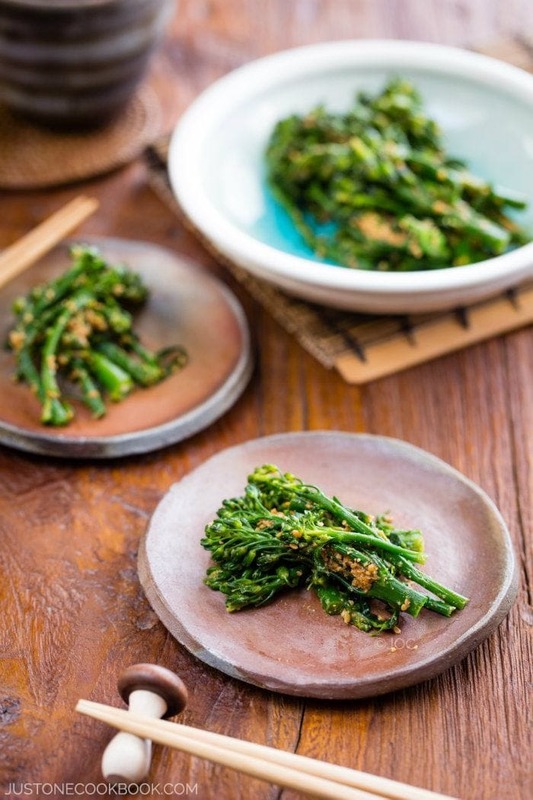 PS- I was wondering if you have a favorite recipe for Okayu (お粥) that you would be willing to share? Since it is “cold and flu season,” I would like to try making that next time I’m not feeling too well. Also, if it is possible to make it in a rice cooker that does NOT have a separate porridge setting, I would love to know how to do it that way. If that’s not possible, then a stove-top method would be fine too. Yay! Thank you so much for your feedback! I’m happy to hear you and your mom enjoyed this dish. 🙂 It’s a perfect bento dish too (meaning we can still enjoy at room temperature). Since my daughter is currently sick with flu, I thought about making okayu too… if I can squeeze in photo shooting I may consider sharing it. We don’t normally eat okayu regularly (like Chinese enjoy for breakfast), I rarely make it unless someone is sick. 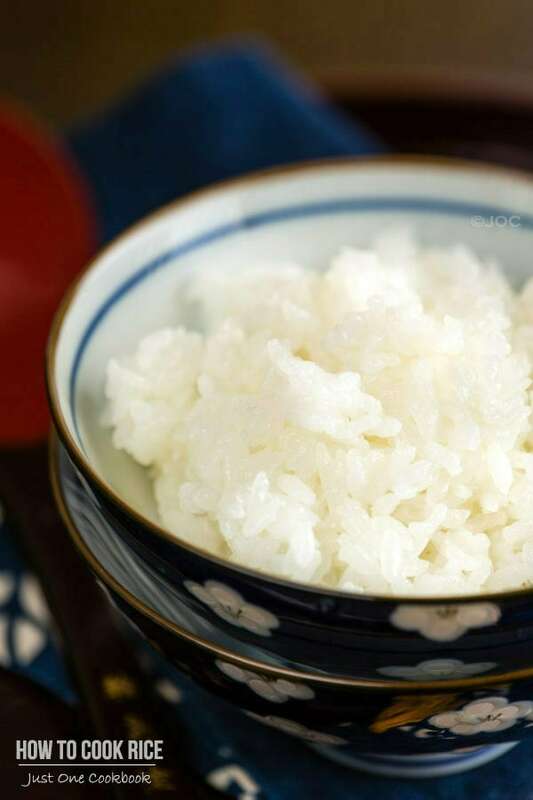 🙂 I never used rice cooker to make okayu (but I am sure mine has the setting). I always think it tastes better cooking in donabe (ceramic pot). If I cannot photo shoot this time, I keep okayu in my requested recipe list. Thanks! My son watched “Itadakimasu! Diing with the Chef” on NHK world and nagged me to get the recipe. Simple to make and delicious! 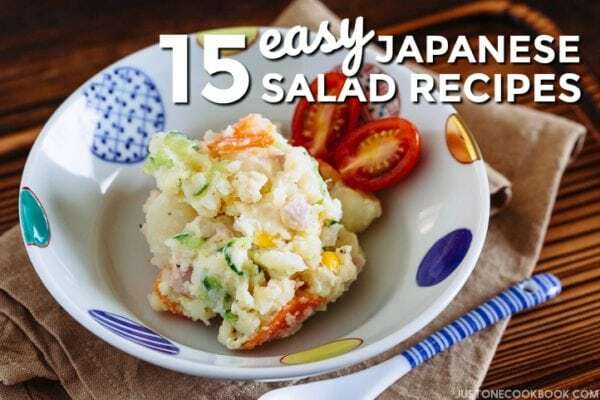 We are going to try other Japanese recipes from your site! Can you suggest a substitute for the wine? We are not drinkers. Now I know the alcohol cooks out but I would rather not have to buy the wine. Hi Dominique! No problem. Adding wine is my arrange (to make it more soft and juicy) but it’s not necessary. After you flip the hamburger steak, make sure you cover to steam. Also the sauce recipe requires wine too, but you can simply omit. The combination of Ketchup + Tonkatsu sauce + water (+ butter) is still delicious! Hope that helps. Other than that I can’t wait to try this! It looks much better than salisbury steaks and the tips are helpful! I always end up with crumbly meat patties, now I know why! thanks! Hope your friends enjoy this recipe! Thank you for sharing this wonderful recipe! The hambagu turned out so moist and it tastes so good and true to the Japanese flavor. My family loves it and I will definitely make it again and again =). trying this tonight! without onions since my hubby hates them… 🙁 But i’m sure it will still taste greaT! I tried the recipe, but found the sauce too salty and too sweet, but cutting back on the salt and tonkatsu sauce might give me a better result. loved the red wine! Hi Tina! Since you only need a small portion, I’d buy one that you would like to enjoy drinking as well. 🙂 Hope you enjoy this dish! In Korea, we have a very similar dish called hambak steak. I think it is type of Salisbury steak but more with Japanese influence. I remember that my father often take my family to the restaurant and ordered this beautiful dish and how much I enjoyed. I think your recipe comes very similar to the flavor I remember. Thanks for sharing, Nami. I want to make this recipe tonight but I don’t have red wine on hand. Can I omit it or any substitute? Hi Justine! For the flavor of hambagu, it is the best if you use wine. However if you don’t mind the difference, you could omit and use lower heat to cook (steam) the meat with the lid on after you flip. You could use a tiny bit of water or sake or white wine to keep it steam (without burning the meat). Hope this helps, and enjoy the recipe! Hi Nami! I’ve cooked this a lot of times and my family loves it. It’s one of our favorites 🙂 I was wondering though, if I can grill it instead? Will it still be as juicy without the steaming part? This looks amazing and I will definitely try to make it! How hard should I toss each ball of meat? Also, how hard should I press with my fingers to indent the patties? One more question, is it 3/4lb of pork and beef each (3/4 lb of pork and 3/4 lb of beef)? Thank you for posting this recipe! Is the beef and pork total 3/4 of a pound to 3/4 pound each? Can I make the patties ahead and freeze them? Hi June! I usually recommend to freeze the hambagu AFTER it’s cooked. The reason is that when you freeze the uncooked patties, the meat and water separates when you defrost the patties. You will also lose umami in the patties. But if you really want to, you can do that. Individually wrap in a plastic wrap (so it doesn’t get freezer burn) and place each patty on top of the metal tray. Place in the freezer flat until the meat patties are frozen, then put all the patties in a freezer bag and freeze. Hope this helps! Nami, I tried your Hamburger steak and it was a big hit with my family. The patties were moist and the sauce was just delicious. It reminded me of the Hambaku steak I loved to eat in Korea as a child. Thanks for the recipe! I love your videos! Can I make a hambagu out of 100% pork meat? Sure you can do that. 🙂 Hope you enjoy! Hi Nami, i’d like to make the hambagu recipe for dinner and use the leftover for my daughter’s bento the following day. So quick question, if I want to keep a burger for the following day, shall I still follow step 11 (adding wine to the pan) or shall I skip it? I dont know if it would make the steak too soggy? What do you recommend? I also wish to thank you for such a fabulous website. Your chicken katsu, chicken karaage and teriyaki dishes are now weekly features at my house. My 4 year old daughter loves taking her bento boxes to school and is mega proud! I could not live without your recipes!!! Thank you! I didn’t see the part of the directions about not adding the to the patties until after they were browned! Opps. I actually added it to the meat mixture and then had to add more crumbs to compensate for the excess moisture. Any way, even with my goof up, the parties and the sauce turned out moist and tasty! Next time I’ll make sure I read the directions a bit more carefully and not rush! Hi Charise! Did you mean wine? Usually the recipe ingredients are in the order of appearance in the recipe (earlier in my blog I didn’t know about it, so it could be different order… but this recipe is ok). 🙂 I’m glad to hear you enjoyed the recipe. Thank you for your kind feedback, Charise! This recipe looks delicious and am thinking of preparing this soon, but I wonder if there is any substitutes for wine since I can not use it in cooking. Hi Omar! Thank you! You can replace it with water or stock. 1/4 cup wine can be replaced with maybe 2 tbsp. water. Just to add some water to steam cooking (so meat doesn’t get too dry). And 3 Tbsp. 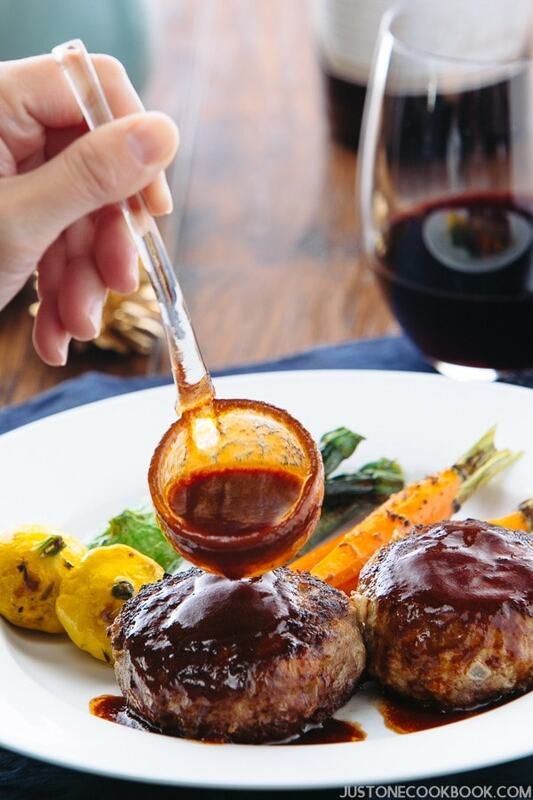 wine for the sauce… can you replace it with beef stock? You can omit but may need to dilute a little bit as it will lack “liquid” in the sauce. Hope this helps! I have made other hambagu recipes, but this was tops! I wouldn’t change a thing. The hamburgers were meltingly tender, and the sauce was delicious. I served it with rice and steamed leeks with sesame and sesame/miso sauce, with a little salad on the side. My Japanese homestay student, Shiju, loved it! Hi Catherine! Wow thank you so much for your kind feedback! I’m so happy to hear you liked this recipe! I make this particular hambagu for years (wait, over a decade!). I’m glad your homestay student enjoyed it too! Your side dish sounds delicious! Thank you again! Great post. I tried your recipe. It was delicious. All your tips were very helpful. Hi Nami! Is it okay to freeze the hambagu patties if I don’t want to cook all of them at one time? I made this for the first time the other night. It was absolutely delicious. I made it with 60/40% hamburger/ground pork. My family completely loved it. Mahalo for another great recipe! What if I don’t have red wine? Can I use rice wine or sake instead? Thank you ???? Thanks for the recipe. I’ve always wanted to try the Japanese hambagu recipe. Just 1 quick question though, what can I replace the red wine with if we could not take the alcohol? Hi Nami, will the hambagu still taste good a day or two after cooking it? I was hoping to include this in my meal prep for next week. Thanks! My Osakan friend made me these when I visited her. I loved them, so good! I just made these steaks myself with this recipe and it turned out exactly like my friend ones <3 I'm happy! This website is such a treasure to me. Hi Maarit! Aww thank you for your kind words. I’m so happy to hear you enjoyed this recipe! Thank you for your kind words! I finally got around to trying these and they were absolutely lovely and surprisingly easy. What would normally be done with leftover hambagu? Hi Emy! Thank you for trying this recipe! So glad you enjoyed it. I usually freeze the leftover in an airtight glass container for individual use (put 4 in each), so I can microwave directly. I use them for kids’ lunch box. True, they really don’t need much, I just heated the leftovers and added a fried egg and it was delicious still the next day. Your recipes get better and better. Thanks for sharing so much. What %age fat (80/20, 90/10) is the ground beef? Hi Tirrill! I think mine has more fat – 80/20, probably. This is one of my favorite recipes to make. It instantly became a family favorite. It must be the Magic of Panco combined with Nami-Magic, because every other receipt which I tried to make Hamburger Patties ended in cumbly meat in the pan. This one worked totally fine for me! And the sauce was so delicious! Thank you for sharing this recipe Nami! True the tossing from hand to hand I never did because it was never pointed out in recipes. Hi, I made this last week and it turned out delicious! I served it with rice and Asparagus. The sauce was very yummy. I wish I would have taken pictures. Finally I tried this hamburger, I accompanied it with japanese garlic fried rice and it was really good !!! Thanks for the recipes, Also at night I made mushi pan of cheese and corn were also a success. However, I had a problem with the hamburger steak and after browning it for 5 min (step 10) and browning the missing side, I decided to cut a hamburger in half and it turned out to be raw !!! Then I had to cut them in half and finish them cooking, although they were delicious, the presentation was not the best. I clarify that I use the same amounts of the recipe and portion the mixture in 4 (besides my fillets were less thick than in the photo. Hi Ruth! Drool… I love this combination of garlic rice and hambagu, and I’ve done that many times. So delicious! Thank you for your kind feedback. I’m glad your cheese and corn mushi pan came out well too! This looks so delicious! Do you think this will work well with a blend of ground turkey and pork? I can’t eat beef… Thank you! This was my first time ever making this meal; it was delicious! My husband (who is ハーフ) really enjoyed eating this meal, too! This is definitely going into my my meal plan rotation. I was a little skeptical of the sauce recipe at first, because I never combined red wine and ketchup in any cooking, but it came out DELICIOUS! I really love this recipe and honestly will never make meatloaf or Salisbury steak again I will just make Hambagu! Hi Casi! I do, but I’m not sure if you can find ingredient…. it’s called Fu (wheat gluten) and you can tear it and mix it in with the meat. Basically, the onion helps the meat tender – so the meat won’t become too firm. Onion makes the patty more tender, not hard ball. You can also use more panko as “connector”. I’m not sure what type of onion you can’t eat, but maybe shallot or other parts of onion too, like green onion or leeks? Hope this helps! Hi Nami, I follow a low FOPMAP diet so the tops of green onions and chives would be my options for onion products, however I do have a Japanese grocery available nearby and may be able to find Fu. I can tolerate small servings of wheat so I may have to switch to gluten free Panko to cut the amount of wheat in the recipe if I choose to use Fu. Either way, you’ve given me what I needed to know next time I make it! Thank you! Love this cookbook ! I have a question, you mention 1/4 of a tsp of salt in the list of ingredients then further down in the list of ingredients you call for 1 tsp of salt. Which is correct??? We attempted your hambagu steak recipe last night for Valentines Day. It was very delicious. Thank you for sharing!!! Hi Victoria! I’m so happy to hear you enjoyed this recipe! Thank you for your kind feedback! xoxo Happy V-day! Thanks for sharing the recipe. I took it for lunch with workmates & they all raved about it 👍 So delicious!! Tried this hambagu for my family, and they loved it! Thank you, it is a different take on the american salisbury steak (boring), and the family loved the shape of the ‘steak’ and the sauce too. Thank you so much Nami. Will try more of your recipes! A really helpful selection of recipes, easy to follow and delicious. I’ve never had hambagu before this. But I have to say that this was the best hamburger patty I’ve ever had. I made this last night, my only sub being Worcestershire instead of tonkatsu sauce. Paired it with an inexpensive William Hill pinot noir. The pan sauce is a real flavor explosion. I loved it. Even my husbando liked this enough to put on our “do it again” list (he’s tolerant of my forays into Japanese cooking but not a big fan). We had grilled asparagus as a side. Thank you for sharing this recipe! Hi Jill! Thank you so much for trying this recipe! I’m really happy to hear your family enjoyed it. 🙂 Your kind words meant so much to me, and thank you so much! Let’s have fun cooking Japanese food at home together! I followed the recipe, but the patties came it too dry and firm….not soft and juicy as described. The patties, without the sauce, could have more flavor. I will try it again but will tweak it by adding mayo and some other stuff to make it more moist and softer. The red wine reduction was good.